In the midst of extensive or frequent civil works, fluorescent high-visibility clothing contributes to the invisibility of the individual, and can serve as a superb disguise. Similarly, in the midst of extensive research and in-depth analyses, basic insights can go unnoticed. Erich Joachimsthaler has plenty of examples in his book Hidden in Plain Sight to drive home the point that attention to stuff that is not so obvious to competition can lead to brilliant success such as Sony’s growth through innovative products (the WalkmanT, for one) that met unexpressed consumer needs. Conversely, an inability to spot this can bring even the leaders down, illustrated once again by Sony’s loss of leadership in mobile personal entertainment to Apple’s iPod. The challenge for companies is to uncover the hidden opportunities by looking into their business from the outside rather than the usual inside-outwards view, and by accurately defining the ecosystem of demand. For most management professionals, this will be harder than it seems. The exercise begins with the question, “Why didn’t we think of that?” This is intended to remind the reader of how the obvious escapes attention as we sink deeper and deeper into complex analysis and in developing ever more complicated scenarios. And Joachimsthaler sets out a framework that he believes can help larger companies to innovate in a structured way. Yes, at the cutting edge, innovation may seem to be more about the innovator’s creative desire to do something different, and less about “meeting customer needs”. Yet, it is the unmet and, more importantly, unexpressed customer needs, that offer the greatest source of competitive advantage. This is why innovation seems to spring more from small companies, or companies that are started up around a specific idea that is unique or new. In such a small company or a start-up, typically the founder/innovator/inventor is drawn from the same pool as the target customer. Therefore, while they may be addressing a need they feel acutely, the innovators are unconsciously plugged into their customer’s unmet/unexpressed needs. There are seldom any silos; the whole team is generally focussed on the one problem to be solved. However, as companies grow larger, functional specialisation emerges &mdash; division of labour based on skill-set is deemed to be a more efficient way of doing things. The design folk design based on “trends”, the marketing folk market as they know best, and the manufacturing folk produce to specification and the “demand” generated. With this speciality of skills taking over, there is a growing disconnect between their efforts to dig for insight and the gold that is “hidden in plain sight”. While data is available in abundance, real knowledge is scarce, and insight just gets buried in well-structured processes and hand-offs between functional silos. This trend has only accelerated in the past 15-20 years with pervasive information technology that enables the mundane operational process to the most strategic. Never before have management teams been so focussed on information and analyses. As businesses grow, data warehousing and data mining are defined as the competitive cutting edge, pushed along by interested parties (including IT solution providers, but that is another book!). However, in reality, excessive information is increasingly passed off as knowledge. An inward focus on the management team”s own objectives is often disguised as insight gained on the customer or the market. Functional specialists analyse the market, the latent needs and the gaps in their own way, and if the company is lucky to have some generalists, some of those dots get joined to form a more complete picture. 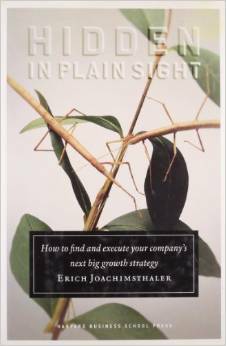 It is in reminding management of this reality that Joachimsthaler’s book provides a tremendous service. It presents a well thought out model named, curiously enough, DIG – short for Demand-First Innovation and Growth. The three elements laid out sequentially begin with a framework for defining the demand landscape, identifying the opportunity space within it, and then creating a strategic blueprint for action. Joachimsthaler’s process to define the demand landscape requires managers to put themselves in the customer’ shoes – a process demonstrated with examples from Proctor and Gamble and Pepsi”s Frito Lay. Using the customer’s goals, actions, priorities (there’s the “GAP”), needs and frustrations, demand clusters can be developed and filled out with additional research. The strategic fit between these demand clusters and the brand can then feed into the next steps of identifying the opportunity space. The filters, or lenses, as the author calls them, are the “eye of the customer”, the “eye of the market”; and the “eye of the industry”. At every step, assumptions and presumptions need to be challenged. Using these lenses, the sweet spot or spots and the growth platforms can be identified, and extrapolated into the strategy. On the downside, the book is clearly about a framework, which may have been best detailed in an article, rather than being stretched over a book. The author does stress at one point that it is not about “brainstorming”, but about structured thinking. However, he seems to do this in a tone that suggests brainstorming as something vaguely distasteful due to the lack of directional structure. While examples from the companies studied keep the text alive, yet in places one struggles to correlate the examples with the framework. Indeed, there may well be too much structure to this book, and not enough examples of how inter-disciplinary thinking and functioning can actually produce sustained innovation. A discount outlet store sells merchandise that is off-season (such as summer merchandise in winter or vice versa) or out-of-fashion (hence possibly two-three seasons old) or comprising of manufacturing over-runs. However, in India discounts are prolific even in the high street market. In clothing as an example, a large chunk (estimates vary from 40% to 70%) of ready-to-wear stock is sold under discount. Some of it is sold in factory outlets, but a significantly larger proportion is sold throughout the year in regular high street stores under offers that run throughout the year. There are also discount streets within the city (such as Fashion Street in Mumbai or Sarojini Nagar in Delhi) operating the year round. This reduces the benefit that a discount outlet specifically provides to the consumer. Second, discount stores typically are based “off-locations” away from regular customer traffic. In markets such as the US and the UK, an “outlet village” may be located 50-100 km from the nearest suburban or urban centre but quite close in terms of drive time. In India currently, due to poor road conditions, the stores have to be in higher cost locations. Most critically, a sustainable and sizeable discount outlet also needs a base of many brands that have built up high profile and that operate consistent price premium at full-price levels. The brands must have enough scale so a discounting outlet cannot damage its brand image. This enables not just standalone discount outlets, but entire “outlet villages” to be set up. These clusters can generate a much bigger and sustainable customer footfall, much like a shopping mall. That ecosystem of brands has been weak in the past in India but has recently accelerated, and we are likely to see critical mass emerging in future, which may allow the discount business to grow. In the coming years, expect more action, with clustering of stores and brands, specialist discount malls, and possibly even innovative and India-specific models to come up. How about air-conditioned haats with proprietary bus connectivity to town centres? Let the good, discounted, times roll. The sector of retail that has been attracting the most corporate interest over the last few years is the food & grocery market. Quite logically so, since this comprises the largest slice of spending – well over 40% in urban markets and above 50% in the lower income towns and rural areas. It, therefore, offers the maximum opportunity for rapid scaling. Working in sequential logic, the nature of that large business would be highly capital intensive, and the large amounts of investment and large footprint should logically act as entry barriers for competitors. Size should also drive costs down through efficiencies of scale and raise margins by removing intermediaries. By that reasoning, the bulk of the small retailers should be out of business very rapidly, as the well-capitalised corporates buy their way into the market, whether by opening their own stores or by acquiring many retail chains and mashing them together into one company. This has led some commentators and consultants to predict that within the next 5-10 years, as much as 25-35% of the food and grocery market would be taken by the so-called organised retailers. That, in my opinion, is a gross overestimation of the pace of change. Fortunately for the smaller retail chains and the independent mom-and-pop stores, and unfortunately for the large corporates, scale and efficiency is not enough of a competitive advantage at the local level. Retail is a business in which you have the opportunity of growing or diminishing your business’ future prospects every time a customer buys at your store, or chooses not to. And the food and grocery business is tougher still, since you cannot impose a product top-down in India, with a mix of cuisines and cultures that are as varied as different countries in Europe. Yes, change is coming to the food business. Like other products, food retailing in India will convert more and more towards modern retail, but it will happen in slices of percentage points. It will happen only when the modern retailers understand and respect the cuisine boundaries rather than imposing a sea of sameness for consumers across the country. It will also need retailers to plan and manage the supply chain and vendors at micro-levels. There are plenty of speed-bumps and potholes on the way – proceed with caution.